Results showed that the incidence of stroke increased by 61% within 14 days of shingles onset. The risk for stroke is significantly increased after the appearance of shingles, despite adequate antiviral therapy and administration of the shingles vaccine, according to preliminary research results1 presented at the American Stroke Association’s 2019 International Stroke Conference, held February 6-8 in Honolulu, Hawaii. 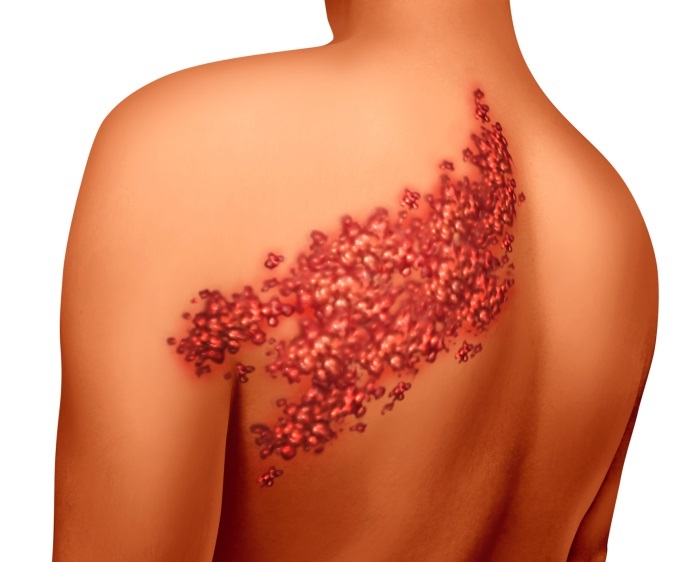 Shingles, also known as herpes zoster, is caused by reactivation of the virus which causes chicken-pox, and manifests as a painful, blistered rash in a unidermatomal distribution. Previous data from a large cross-sectional cohort published in the Journal of the American College of Cardiology, has demonstrated a 35% increased risk for stroke, which was highest in people under the age of 40 years who had fewer risks for atherosclerosis.2 This, taken in combination with recognition that 1 in every 3 people in the United States will develop shingles in their lifetime, catalyzed researchers at the Centers for Disease Control and Prevention to analyze the effects that the Zostavax shingles vaccine, antiviral therapy, or both may have on stroke risk in people who have developed shingles. The current study included 35,186 Medicare fee-for-service beneficiaries who had experienced herpes zoster and acute ischemic stroke between 2007 and 2015. Among this group, 60.9% had no vaccination and no antiviral treatment, 11.8% had the vaccination only, 22.2% had antiviral treatment only, and 5.2% had both the vaccination and antiviral treatment. Results showed that the incidence of stroke increased by 61% within 14 days of shingles onset (0-14 days, incident rate ratio [IRR] 1.48; 95% CI, 1.37-1.59), remained elevated for 6 months, and then decreased over time. No evidence was found that demonstrated a reduced risk for stroke in any patients who received Zostavax or antiviral therapy for shingles (all P values for interaction across 4 groups IRRs >0.05 with the smallest P =.129). However, researchers did note that vaccination may be the most effective mechanism of preventing shingles, and thus shingles-associated stroke risk. Of note, the efficacy of Zostavax is known to decrease over time; protection from shingles lasts roughly 5 years after vaccination. Researchers acknowledged that although the United States Food and Drug Administration approved a new shingles vaccine in 2017 called Shingrix, which has since demonstrated >90% efficacy at preventing shingles. Data for Shingrix vaccination of people who have Medicare was not available. 1. Yang Q. George MG, Chang A, Merritt R, Hong Y. Effect of herpes zoster vaccination and antiviral treatment on risk of ischemic stroke among older adults. Presented at: 2019 International Stroke Conference. February 6-8, 2019; Honolulu, HI. Abstract 39. 2. Shingles increases risk of heart attack, stroke [news release].Washington, DC: American College of Cardiology. https://www.acc.org/about-acc/press-releases/2017/07/05/09/53/shingles-increases-risk-of-heart-attack-stroke. July 3, 2017. Accessed January 31, 2019.